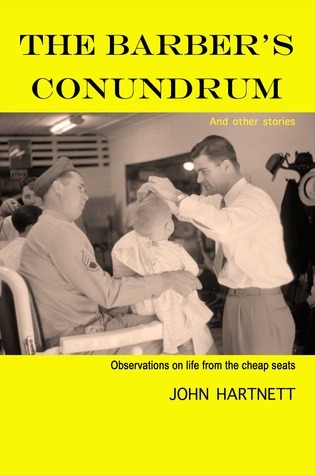 John Hartnett humbly offers the reader his collection of essays in the introduction. He tells the reader about his family and the articles he wrote for a local newspaper. Then he gamely tries to convince you to read the tales and musings that will follow. "Where do I begin? You've never heard of me, I've never heard of you and yet here we are. Could it be fate? God certainly does move in mysterious ways, particularly if he had anything to do with Jersey Shore running for 66 episodes." The pieces included in The Barber's Conundrum are observant, heartfelt, and will give you more than a few chuckles. Mr. Hartnett is a certain kind of writer. You probably have one like him on your local newspaper's staff. He writes about the little absurdities of life - the weatherman drowning in the hurricane so that he can report about it, the bananas his wife puts in the freezer but never bakes with, and the contradictory advice of popular magazines. One of my favorites was "If We're Late for Church Again, I Will Kill You." As the daughter of a pastor, I couldn't help but laugh when he wrote, "Do you know what a paradox is? Doesn't matter. I'm going to give you an example anyway. A paradox is when a family comes within a hair's breadth of killing each other in order to attend mass on time and emerge afterwards with a feeling of peace and spiritual reaffirmation." His family's ten commandments for attending church include not pretending to be dead on a Sunday morning, not switching seats, and not standing on the kneeler. If they can observe these rules, surely they will be rewarded with donuts. Reading this book feels like sitting down with your dad or big brother. He's going to make fun of you a bit, but you will be laughing the whole time. This is not a book I would read straight through, though. Hartnett's humor is familiar and on point, but it can start to feel repetitive after reading for a while. When it's read the right way, these tiny musings are perfect for bringing a smile to your face, breaking up reading a big book or making a bad day a bit better. To the ladies and gents of the FTC: I received this book in exchange for an honest review. All opinions are my own. He sounds a bit like Andy Rooney from 60 minutes (who I miss dearly). This sounds like a fun, entertaining read! That is a great comparison! Wednesdays with David: Good Luck, Anna Hibiscus! It's Monday - are you ready for Halloween? It's Monday - hello from my new computer! It's Monday and I'm going to take a nap! Wednesdays with David: When Robots Attack! It's Monday...where did the week go?